Since that very first movie, each director has been tasked in making the next cars better than the last and so our journey of the biggest movie franchise in history, brings us to the eight movie. Having watched closely some of the car builds for this latest movie, there was one in particular that caught our attention back over a year ago. 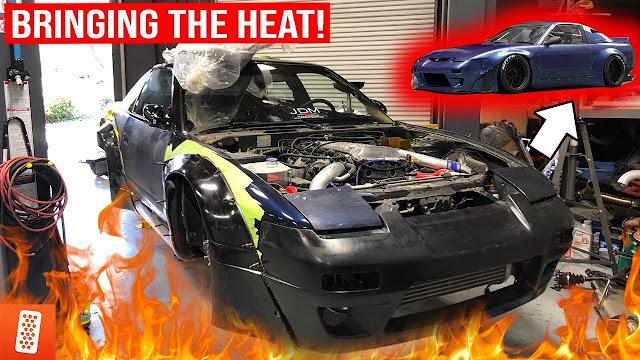 It was when we were visiting Dennis McCarthy, who is the owner of Vehicle Effects in Los Angeles, where we got to see the car being built but were sworn to secrecy. I remember being shown the drawing on the side of a toolbox to then turning to where the car was at the beginning stages of the build. Just back then we could at just how insane this build was going to be. Think a mix of Ken Blocks Mustang and a car from the Mad Max movie. When we arrived, we met Dennis who took us inside his garage where all of the Fast and Furious car are being housed, including all the ones from the latest movie. When we walked into the main room, there were six Ice Chargers! As with all movies, Dennis creates more than one, just in case one breaks and lucky for us, Dennis had the original Charger that was built for the movie and so we took it out into the sunshine for some photos. The result, well you can just see how it looks mind-blowing and it was the reason we came back to Vehicle Effects a month prior to the films release to capture these photos and put it on video. Now the first thing that struck us with a question…Is that turbine in the rear a fully working one? Unfortunately it isn’t and is only a movie prop, which on set, jet sounds are added.